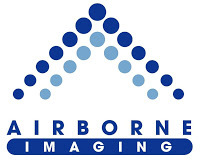 LiDAR Provider Airborne Imaging Partners With FBS | First Base Solutions Inc.
LiDAR (Light Detection And Ranging) data is collected in a similar fashion as aerial imagery we collect from fixed wing aircraft. Instead of producing a digital photo from natural light reflecting off the ground, however, the LiDAR equipment sends out hundreds of thousands of laser pulses per second and collects point clouds from the reflected pulses. The point cloud can then be used to create digital elevation models depicting all ground features, or the bare earth. 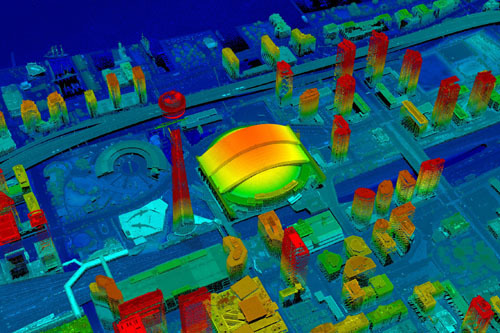 How Does LiDAR Compare To Aerial Imagery? Because LiDAR does not rely on natural light, data collection can take place day or night, whereas aerial imagery is limited to midday collection when the sun is overhead, and even then, shadows can affect the quality of the imagery. The horizontal and vertical accuracy of elevation models produced by LiDAR and traditional aerial imagery are similar, around +/- 8cm at best. In both cases, hard flat surfaces produce the best results. Water and wet soils, however, can prove more difficult for LiDAR than aerial imagery since the laser falls in the red spectrum. 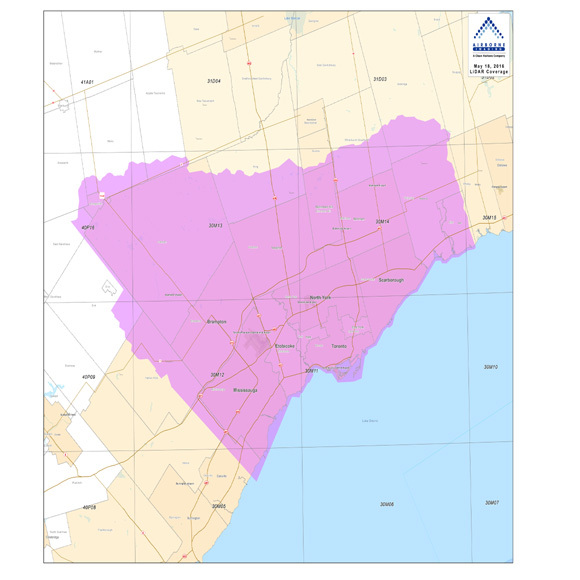 Airborne Imaging has LiDAR libraries covering select areas in the United States, Western Canada, and most recently, Toronto. The Toronto data has been calibrated from an 11 point per square meter point cloud, processed into a bare earth model, and clipped into 500m x 500m geotiff tiles, which will be available to download from MapWarehouse in early 2017 for $100 per tile. LiDAR is a great tool to capture large areas of data relatively quickly with excellent detail and accuracy. To purchase tiles from Airborne Imaging’s LiDAR based elevation model, please visit MapWarehouse.